Living a healthier lifestyle isn’t all about working out in the gym. 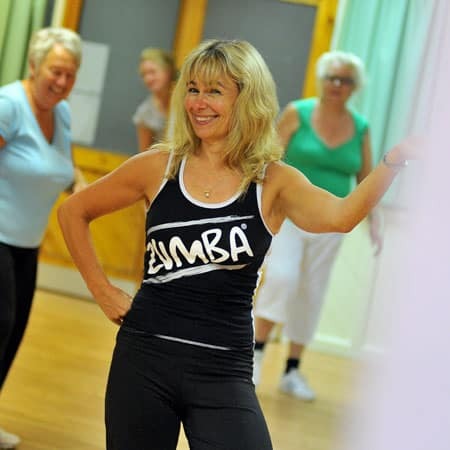 Fitness classes are a great way to stay fit, socialise and have fun! We have over 550 weekly fitness classes to suit all ages, abilities, tastes and energy levels. Find out all about them below! Remember, all Brio classes are available to members and non-members alike! You can find price lists on our Centre Homepages for PAYG classes, and if you’ve got a fitness membership with us then all of these are included within that! Aqua Dance Great music and a variety of dance moves, all in the water for a low-impact workout. Aqua HIIT This is a water-based interval class that combines periods of intense exercise and varying amounts of rest. Aqua Mitt This high-intensity aqua class zones in on the upper body by using gloves to add extra resistance to your movements. BODYATTACK A sports-inspired cardio workout for building strength and stamina. This high-energy interval training class combines athletic aerobic movements with strength and stabilisation exercises. Brio Burn This easy-to-follow aerobic exercise class will work your entire body from head to toe and is suitable for all fitness levels. Brio Dance A high energy dance class that will sculpt your body to the latest music with different genres of dance. Brio HIIT High-intensity interval training helps you burn more calories in less time! It lowers your fat composition and will keep you burning calories long after it’s over. Brio Move A gentler paced aerobics class that is perfect for those who need a low-impact workout whilst still getting results. Brio Move Circuit A gentler paced circuit class that is perfect for those who need a low-impact workout whilst still getting results. Brio Cycle A popular group cycling class set to motivating music that offers a highly effective workout. Brio Cycle (Post-Natal) Ideal for new mums, bring your baby in your car seat and don’t worry if you need to look after them as you’re all in the same boat! We recommend that you check with your midwife that you’re fit and ready to tackle this class. Brio Step A fun cardio workout using a step that’ll have your bottom half burning calories! Coach by Colours Suitable for participants of all fitness levels, this class will have you working to your personal limits using a colour coded system! Clubbercise Clubbercise is an easy to follow dance fitness class with music anthems from the ’90s to the latest hits, all in a darkened room with disco lighting and flashing glow sticks! FitSteps Shimmy and shake your way to fitness. Founded by the Strictly Come Dancing professional dancers, this class blends authentic ballroom and Latin dance moves into a fun and effective group workout. FitSteps Fab Shimmy and shake your way to fitness! This Fab class is aimed at beginners, and so is a little slower paced. Metafit & Core An effective metabolic workout using your own body weight, that burns fat 24 hours post workout! This version adds a short core workout to the end of the class. Vibe Cycle An indoor cycle class designed around the beat of the music. Virtual Cycle Immerse yourself in indoor cycling on the big screen! Just turn up and we’ll do the rest. Zumba Join the Zumba revolution and party your way to the body you’ve always wanted in this fun and exciting fusion of Latin and international dance. Zumba Gold This class takes the Zumba formula and modifies the moves and pace to create a gentler class that is still loads of fun. Zumba Toning Shake it, tone it, rock it! The Latin-inspired dance fitness party that provides serious sculpting for party animals. BODYBALANCE Ideal for everyone, BODYBALANCE is a yoga-based class that will improve your mind, your body and your life. Brio Stretch Improve your core strength and flexibility in this slower-paced class whilst working your entire body. Hatha Yoga A gentle paced stretching class that will increase your flexibility and strength. This class combines yoga poses and relaxation techniques that will condition your body, and reduce stress. Iyengar Yoga This class combines a series of gentle yoga movements alongside breath control that will not only increase your stamina but also strengthen and condition your body. Pilates Invigorate your mind and condition your body through stretching and strengthening moves focused around your core muscles. PiYo PiYo is a fun, challenging class fusing Pilates and Yoga set to vibrant music. You’ll burn calories, tone muscle, work on balance and get a great stretch. Pure Stretch Work on your core, your balance and your flexibility with a range of floor exercises. Strala Yoga Strala is an easygoing approach to yoga that brings the moving and healing principles of Tai Chi and Shiatsu – moving like water, fueled by the breath. Tai Chi This ancient Chinese tradition will relieve stress and anxiety promotes serenity and inner peace. Yoga A gentle paced class that will guide you through a series of structured sequences of postures and movements. Yogalates This class is excellent for developing general tone and fitness, while also encouraging a connection with self-belief to soothe the nervous system, release stress, aid relaxation, calm and overall wellbeing. BODYCOMBAT A popular martial arts group fitness class. Get ready to strike, punch and kick your way through calories to superior cardio fitness. BODYPUMP This workout challenges all your major muscle groups by using the best weight room exercises like squats, presses, lifts and curls. Boxercise Punch your way to fitness in this fun, energetic combat-based fitness class. Brio Ball The ultimate total body conditioning class using balls, bands and your body weight with moves that are fun, easy on the joints and deliver effective results. Brio Box One of the most fun, challenging and effective full body workouts using combinations of pad work, skipping and body weight exercises. Brio Circuits Get seriously fit with a number of different exercise stations and drills to truly test your fitness levels. Brio Core Zone in on your ab’s to strengthen your core whilst also improving your posture and overall fitness. Brio Kettlebell An intense class that’ll leave you feeling stronger than ever before! Brio LBT Tighten and tone your legs, bums and tums in this effective workout. Brio Mix-up A 3-part workout involving aerobics, conditioning and core exercises. Gym HIIT Taking place on the functional training frame in the gym, this high-intensity class will have you doing a variety of workouts at each station. You’ll need a gym Welcome Workout before attending this. Hoola Hoop Sculpt your abs, build muscle and core strength in this fun class. Special hoops provided to enable everyone to join in. Kettlercise Using light weights and a non-stop routine, you will work every single muscle in your body. The Hour of Power Get ready to challenge your mind and your body in this amazing new fitness experience, using dumbbells and body weight exercises to tone and dramatically improve your fitness levels.